For the last few years we've all been going crazy over Lalaloopsy! My daughter Allyson is a big fan of the show, the dolls, the wigs, oh my goodness; I could go on and on with all that is Lalaloopsy. Instead I want to tell you about a new product they have this year that is a perfect fit in our Holiday Gift Guide! 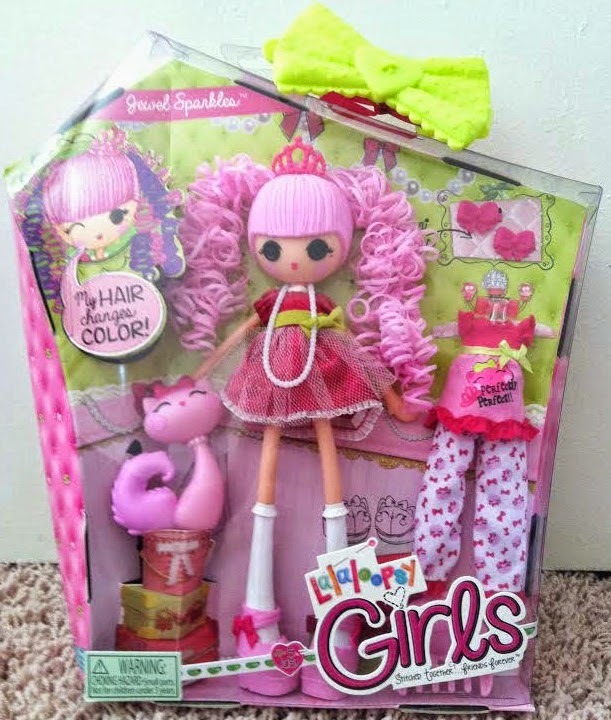 The new Lalaloopsy Girls line has six dolls that each bring something special to the scene! We were given a chance to review Jewel Sparkles. Let me introduce you to her! Hello! Jewel Sparkles here! I was sewn from a royally sparkly princess' dress. Which explains why I love to be in charge - It just comes naturally. All my friends come to ME (and my cat/style advisor) for ALL their fashion emergencies. And in extreme cases I will even share my tiaras. Jewel Sparkles and Allyson are great friends! Jewel is made the with same quality as the previous Lalaloopsy dolls and comes with great accessories. As she loves cats, of course she brings her beautiful kitty along as well as a pair of pajamas to wear to the Pajama Party! A really fun part of Jewel Sparkles is that her hair changes color when activated by cold. 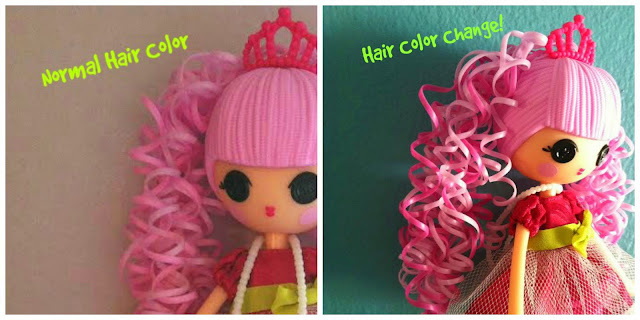 Lalaloopsy recommends you dip her hair (Only her hair please! Not her whole head.) in ice water to get the color change. Super easy and really fun! Isn't the darker pink color in her hair just the cutest? This has struck Allyson to want a little change in her hair color. Lucky for Mom, I have removable color to put in her hair so she can be cute right along with Jewel Sparkles! Lalaloopsy Girls is a great gift to give your Little this Holiday Season! Check out their website to find out which doll fits your girl and go from there! So many options! I am super excited for this doll! My daughters are huge fans! She is super cute! I love that her hair changes colors! I love Lalaloopsy and so do my daughters! I know they would love this. I really love her hair!! Very pretty. Awww that is super cute. That would make a great gift this holiday! These are so cute...too bad my son won't go for them!